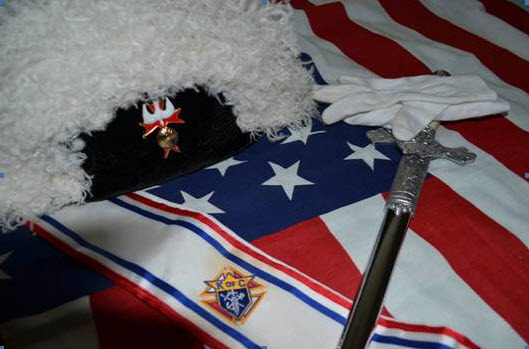 The Fourth Degree Exemplification adds "Patriotism" to the three original principles of the Knights of Columbus: Charity, Unity and Fraternity. By joining the highest degree of the Knights of Columbus, members make a commitment to their Country and their Order. On July 10, 1995, three Knights of Columbus Councils came together to form Bishop Joseph A. Durick Assembly 2399 at St. Patrick. The Councils were 10567 in Adamsville, 10354 in Gardendale and 8551 in Jasper. During the years since, our Assembly has been faithful servants at Honor Guards and special ceremonies at St. Patrick Church. Faithful Outer Sentinel - Carl Ray, Jr. The primary purpose of the Fourth Degree is to foster the spirit of patriotism and to uphold the Catholic faith. Through active membership in local Fourth Degree groups (called Assemblies), Knights promote responsible citizenship and a love of and loyalty to the Knights' respective countries Third Degree members who have been a Knight for at least one year are eligible to join the Fourth Degree. Fourth Degree members must retain their membership as Third Degree members in the local council to remain in good standing. Fourth Degree Knights wear regalia and participate in Honor Guards and special ceremonies. They serve at wakes and funerals as a way to pay great respect and honor to deceased brother Knights. The Fourth Degree was initially started at a National Council meeting in 1899, when it was determined that an additional ceremonial degree was needed that would represent patriotism. The initial Exemplification, as the degree is called, was held on February 22, 1900. Originally scheduled to be held in the Astor Hotel, the Exemplification was moved to Lenox Lyceum, a temporary wooden structure, when the proposed class grew to more than 1,100 candidates. Members were originally part of local councils. But in 1910 a restructuring of the order separated the two and called the groups Assemblies. Starting at the Supreme level there is the Supreme Master and the Supreme Board of Directors. The next level of the structure is broken into provinces of which there are 21. Each province is lead by a Vice-Supreme Master. The Vice-Supreme Master wears a light blue lined cape and chapeau. There are currently 15 provinces in the United States, 4 in Canada, 1 in Mexico and 1 in the Philippines. Each province is broken up into districts. Most districts are either an entire State or a section of a larger State. A Master is in charge of a District and wears gold lined cape and chapeau. Masters are responsible for overseeing the Installation of Fourth Degree Assembly Officers, The Renewal of Obligations in January, and holding at least one Fourth Degree Exemplification each year. Also, a Master usually has a District Marshal to assist him. The District Marshall wears a green lined cape and chapeau. The Faithful Navigator wears a white cape and chapeau. The Jewel for the 4th degree officers is suspended from a red, white, and blue ribbon. Each contains the Fourth Degree Emblem and title of the Officer's position. Assemblies are similar to the Council, and many are named after patriots, war heroes, etc. The Chair Officers are: the presiding officer called a Navigator, then a Captain, the Pilot, which is the Warden on a Council level, and the Admiral, a Past Faithful Navigator. As of the end of the fraternal year 2004, there were 2,529 Assemblies and 286,630 members in the Fourth Degree of the Knights of Columbus. Once a Sir Knight attains an office, he is entitled to wear the colors of that office until elected or appointed to a higher office, except for the Marshal (appointed by the Master of District) and the Color Corps Commanders (appointed by the Faithful Navigator) who are appointed for a specific term and then revert to their previous colors when that term expires. Former VSMs, DMs, and PFNs are all permitted to wear their respective capes and chapeaus when they finish their term of office. Considered under a religious aspect, we have the honor and privilege of wearing on our sword and our lapels the sacred symbol of the Most Blessed Trinity. This is to always remind us to live a good Christian life. By this, others may see our good works, through which we will glorify our Holy Religion, our Honored Order and our Beloved Country. The triad emblem of the Fourth Degree features the Dove, the Cross, and the Globe. Spiritually, the sacred symbols on the emblem typify the Union of the Three Divine Persons in one God, the Blessed Trinity. The Dove is a classic symbol of the Holy Spirit and of Peace. It is shown hovering over the orb of the Globe. Both are mounted on a variation of the Crusader’s Cross, that which was found on the tunics and capes of the Crusading Knights who battled to regain the Holy Land from the pagans. The colors of the symbols also represent patriotism. The emblem shows a blue Globe with the lands of the Western Hemisphere in white; a red Cross with gold borders, and gold knobs at the end of the points forming the ends of the arms of the Cross (also known as the Isabella Cross). The Dove is white. The colors red, white and blue are the colors of the flag of the country in which our Order originated and are used to stress the basic principle of the Fourth Degree…Patriotism. You are welcome to view any of our pages to learn more about the Fourth Degree. You can click on Photos of Sir Knights in Action or Monument to Veterans of All Wars. We think you will enjoy it.